USA Today bestselling author Gigi Pandian is here to share recipes for two elixirs to accompany her new Accidental Alchemist mystery, The Elusive Elixir, coming from Midnight Ink January 8, 2017. Read on for two recipes, plus a chance to win a set of 7 book-themed recipe cards. In alchemy, the Elixir of Life is the substance that grants immortality. Centuries ago, the men who laid the foundation for modern chemistry were interested in transforming lead into gold, and some believed they could perform another transformation: turning their mortal bodies into immortal ones. 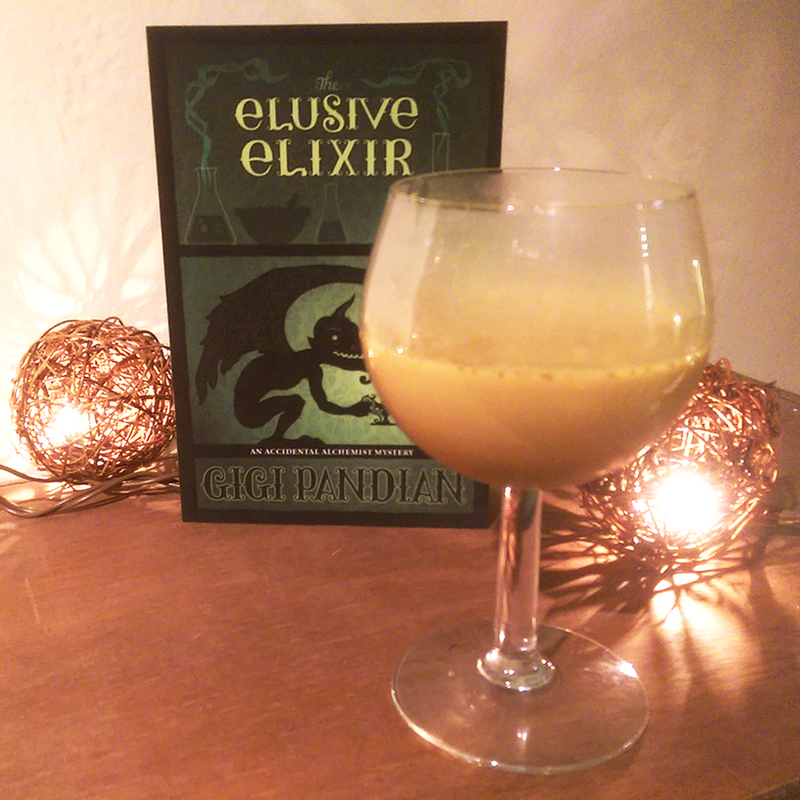 That transformation is the subject of my latest mystery, The Elusive Elixir. I wrote the first Accidental Alchemist novel while I was going through chemotherapy for an aggressive cancer discovered shortly after my 36th birthday. What was I to do with such a shocking diagnosis that left me with food restrictions? Two things were high on my list of priorities: Throwing myself into writing, and learning how to cook from scratch. I wasn’t about to give up my dream of getting published, or give up eating and drinking delicious foods. The result? Cancer taught me how to write with my heart and showed me that I love experimenting with recipes. As you can imagine, ideas about the Elixir of Life were swirling around my mind at the time, and made their way into both my writing and my cooking. My mantra for recipes is “healthy and delicious.” So today I’m sharing two takes on an elixir that’s wonderful for a wintery day, or for a hangover, or if you feel like you’re coming down with a cold. The two recipes are identical except for one substitution (milk vs. lemon base) and the preparation methods. Warm all the ingredients in a saucepan on the stove. No pan is required. Put the ingredients in a mug and pour in a cup of hot water. In the Accidental Alchemist mysteries, Zoe Faust is an herbalist and alchemist who accidentally discovered the Elixir of Life three centuries ago. She’s tired of running from her past and buys a crumbling house in Portland, Oregon. But her presence hasn’t escaped notice. She’s sought out by Dorian Robert-Houdin, a three-and-a-half-foot tall gargoyle chef who fancies himself a modern-day Poirot—and he’s always getting into trouble. Dorian was once stone before he was accidentally brought to life through alchemy, but now he’s slowly turning back to stone. In The Elusive Elixir, it’s Zoe and Dorian’s last chance at finding the Elixir for Dorian, or he’ll remain awake but trapped in stone forever. From Portland to Paris, Zoe follows clues to decipher an ancient alchemy book, but is thrown off course by a murder from her past. The books include plenty of cooking as French chef Dorian learns how to cook gourmet meals without bacon or butter (yes, Dorian’s journey was similar to mine), and recipes are included in the back of each book. 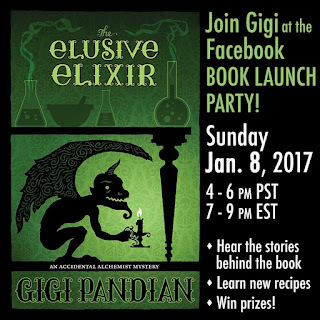 Gigi Pandian writes the Accidental Alchemist mysteries, Jaya Jones Treasure Hunt mysteries, and locked-room mystery short stories. Learn more about Gigi and her books at gigipandian.com, connect with her on Facebook and Twitter , and keep up with the latest by signing up for her email newsletter. Want more recipes from Gigi? Leave a comment below, and one lucky winner will receive a set of 7 book-themed recipe cards with recipes inspired by each of Gigi’s books. Gigi, I love this. What a great way to overcome cancer and become healthy at the same time. Plus provide great books. I would love to win the book themed recipe cards! I am a big fan of the Jaya Jones series and the alchemist one is now going on my list. I love the author's inspiring back story and the fact that I can make a drink with almond milk, which I love! Oh, thank you, Kerry! I hope you have fun with the Accidental Alchemist novels. Leaving a quick comment before I go to the kitchen and try one of the elixirs (the one with lemon since I am out of almond milk). Love what I have read so far, only 3 of the various series but all within the past 2 months since discovering this wonderful author, and looking forward to more. Thank you, Earl! The lemon elixir is lighter, so I drink it more often. I judge books by titles and covers and your series is really intriguing. I may need an elixir while I read kind of evening. 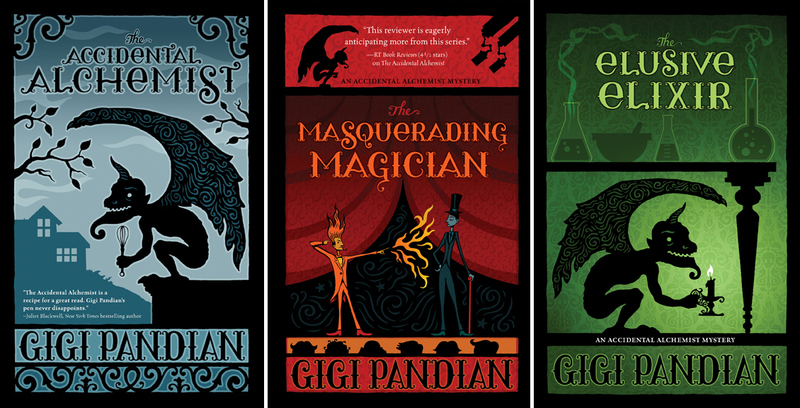 I really lucked out with the fantastic book covers Midnight Ink made for the series. Illustrator Hugh D'Andrade is fabulous. Annette, you're the winner of the set of recipe cards! Please send the Mystery Playground Facebook page a direct message with your address. I love your books Gigi. I will be trying the elixirs as well. Thanks for this wonderful feature and giveaway. Gigi's novels are real treasures. After being diagnosed with breast cancer in 2012 which was a shock, living a healthy life and exercising etc. i continue to thrive and now have RA. Nothing holds me back. Oh, thank you! And I'm so glad you're thriving after your cancer diagnosis as well. 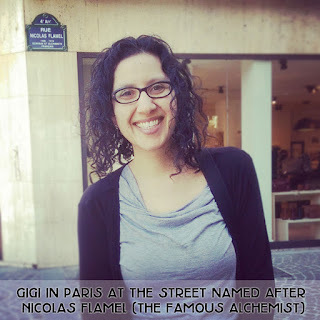 Thank you for a wonderful post Gigi! I cannot wait to read the book while I'm drinking healthy elixirs. I love Zoe Faust and Dorian. I can't wait to see what adventures they have this time around. Thanks so much -- I hope you enjoy the new book! A most talented author whose novels I enjoy greatly. Almond milk is a staple in our home and is so tasty. Many thanks for a delightful and special post today. I'm so excited for the newest Zoe and Dorian adventure!! It's coming out a few days before my birthday, Happy Birthday to me! Hope you're having a wonderful new year, Terrie! I made the Cashew Cream Mac & Cheese (from book 2) and it was amazing! I gave it to one of my students who has dairy allergies. She was so happy! I haven't read this series yet, but it sounds like an amazing read. Love trying recipes I find in books, these sound really good. Gigi, we love your alchemy and Jaya books and can't wait to read (listen...) to this one. Best wishes for continued success!!! Thank you, Trish! The audiobook of The Elusive Elixir will follow soon. I'll post the date once I have it. I need to get some turmeric so that I can try these recipes. I love both your series! Cheers to many more books and staying healthy! I am unfamiliar with this series, but it sounds right up my alley. As far as the recipe cards, well, step aside everyone , these are MINE! I am all about great mysteries and great cooking, when the two combine, it is magic. I hope you enjoy the books along with the recipes that are included! The contest in now closed. Our winner is Annette W! Please send us your e-mail address via private message on the Mystery Playground Facebook page.